In a previous life, when I was part of a start-up effort to raise money for higher education, my dear boss Jim characterized my particular assignment this way: “It’s like driving a car while you’re building the engine.” Don’t expect it to be comfortable, he might have added. And don’t expect to be given all the parts that you’ll need. This theme continues to repeat itself. Again and again, I am called out of my comfort zone, and, by grace, once in a while I actually venture out. Preaching definitely calls me out of my comfort zone. 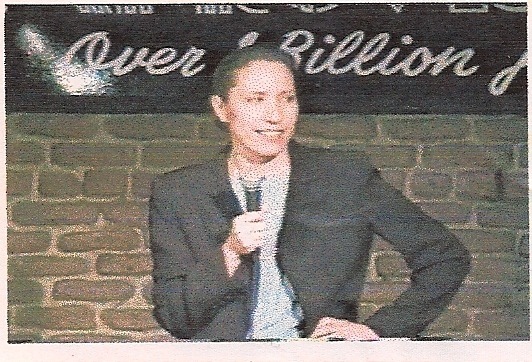 It is a lot like my earlier, brief stint in stand-up comedy. As a child, I had loved watching the Carol Burnett Show (I can do a wicked Mama) and later fell in love with Ernestine the Operator, Edith Ann and other characters brought to life by Lily Tomlin. For a season, in Los Angeles, I spent time in comedy workshops and took a turn performing at the Improv on Sunset Boulevard. It took weeks to develop 5 minutes of solid material, and the anticipation of standing on that stage did a number on my GI system. The thing about comedy is you don’t have the luxury of working it out in the privacy of your own home. That approach simply will not work. Comedy has to be developed in a theater setting with live bodies — not your friends and family — listening and responding. Audience members come with their own individual sets of expectations, some wanting relief from a miserable life and others simply ready to enjoy a good laugh. Preaching is not so different. Many weeks there is a moment when it seems unlikely that I will have anything to say. Then I dive into the text and into prayer. Sometimes the “material” that presents itself surprises me and I have a hard time imagining that folks in the pews will respond to it. But I can only work with what I have, and, in the end, I must trust the Holy Spirit to do her thing. Being called to develop new ministry is similarly daunting, only on a grander scale. It requires lots of prayer and a willingness to tell a story of what God seems to be doing before the vision is fully formed, fully revealed. This flies in the face of my carefully planned approach to major gift fundraising. There are no elaborate laboratories to show people, no beautiful, very expensive architectural renderings or glossy brochures, just a heart to reach out to people who are wandering through life, wondering if there is any meaning to be found. Wondering if this is “all there is.” Wondering if they are truly alone and if there is anyone they can trust with their heart of hearts. This work requires people who are not afraid to venture out and risk failure. It requires a willingness to share from a place of vulnerability and a humility that says: I have no idea how God plans to accomplish this thing but I wonder, as I sit here and we chat, I wonder if you might feel called to be a part of this thing. We do not have all the parts we will need. But I think we will find that those gaps leave lots of room for the Holy Spirit. This entry was posted in congregational development, Episcopal church, St. Clare of Assisi and tagged church planting, comedy, new ministry, preaching, stand up comedy. Bookmark the permalink. Wow! The Holy Spirit as woman? Beth as a stand-up comic? I think I like it!